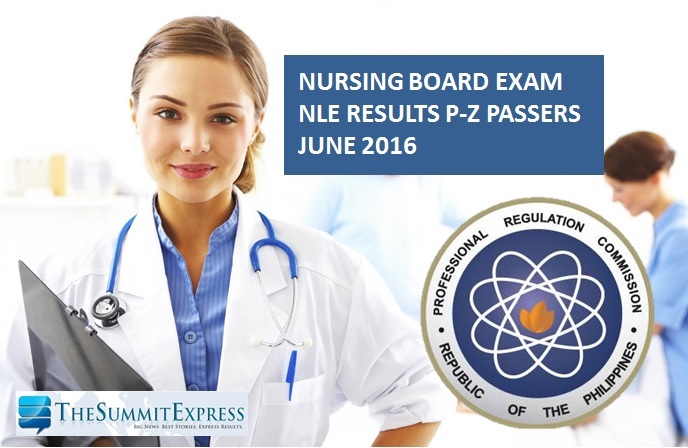 MANILA, Philippines - The Professional Regulation Commission (PRC) officially released today the results of June 2016 Nursing board exam (NLE). A total of 6,183 out of 14,184 successfully hurdled the NLE given on June 5 and 6. The complete list of passers in alphabetical order (P-Z) is now available online. PRC and the Board of Nursing (BoN) conducted the nursing board exam in various testing centers nationwide: Manila, Bacolod, Baguio, Cagayan de Oro, Cebu, Davao, Iloilo, Legazpi, Lucena, Pagadian, Tacloban, Tuguegarao and Zamboanga. The complete list of passers in alphabetical order (P-Z) surname is now available here.